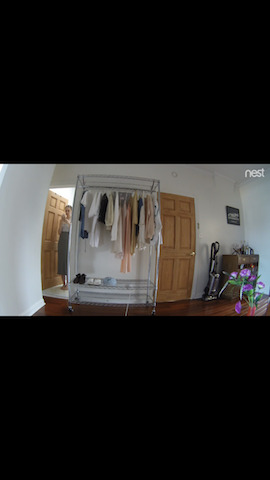 Natalia Panzer and Elliott Radner set up a Nest Cam in the apartment's living room to stream a still shot of a rack full of Natalia's favourite clothes and accessories. The magnetized Nest Cam was stuck to an overturned enamel saucepan that was balanced on top of an overturned plastic Muji container that was set on top of a Fender amp that was set on top of a chair. 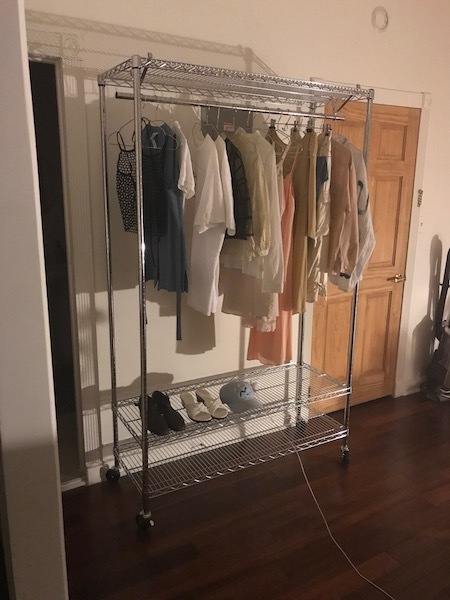 The upper rack included a halter by yma, a vintage shirt by B’Zone, a polo by Madalyn Merkey for Extensive Index, a Lunch Time! I’m Hungry! mmmmm t-shirt by Sean Tatol, a Darkness of Modarn Society t-shirt by emamouse, a black shirt by Gracia, a vintage blouse by an unknown maker, a vintage shirt by Prada, a slip by the Gap, a vintage slip by an unknown maker, a vintage dress by Little Miss, a dress by an unknown maker, vintage pants by B’Zone, vintage pants by Joie, a vintage jacket by Ann Taylor, and a jacket by Clifford Morrissey. 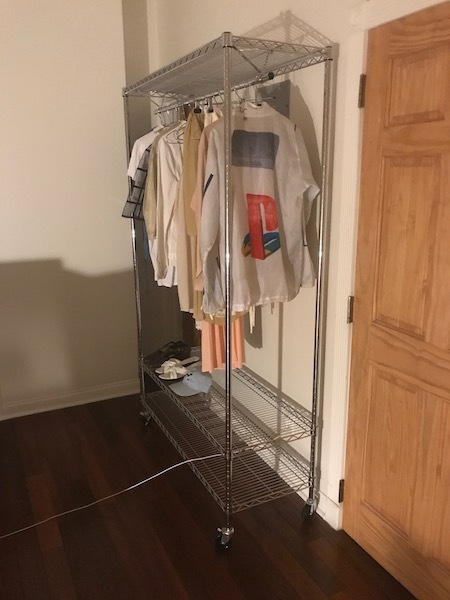 The lower rack included vintage sandals by an unknown maker, vintage sandals by Italian Shoemakers, and a cap by mushbuh. The live steam was hosted at thecreativeindependent.com as part of their Weekend Artist series.